Use Our Product Finder you may have to make up to 10 selections. What are SEAT- FITTED Air Bags? BLACK DUCK SEAT COVERS - Dual Cab COMPLETE Front & Rear - Suitable for TOYOTA LANDCRUISER 70 series VDJ79 2017 UPGRADE from 09/2016 onwards " Current Model ". Black Duck Seat Covers to fit Driver & Passenger Buckets (Set). Suitable for Toyota Hilux Utes 4x4 SR Single, X-TRA & Dual Cabs with Seat-Fitted Airbags. SEE DESCRIPTION. 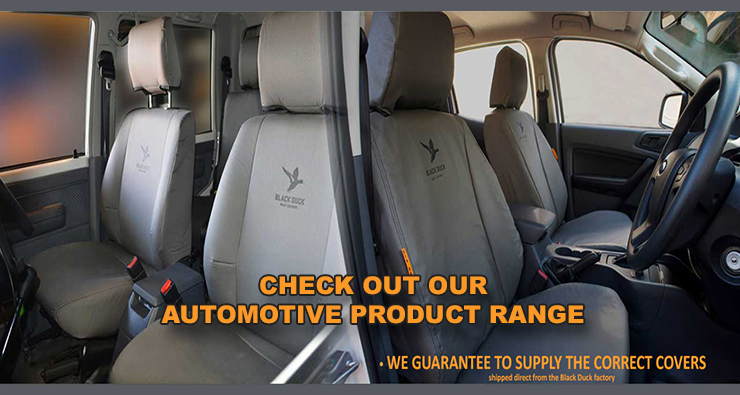 Black Duck Seat Covers - Driver and Passenger Buckets (Set) - suitable for Toyota Hilux 4X4 SR5 DUAL Cabs from 08/2009-06/2015 & X-TRA Cabs from 07/2011 - 06/2015 NOT for 2014 with Leather seats. PX1 Ford Ranger SUPER CAB Combined set of FRONT & REAR XL, XLS, XLT & WILDTRAK from 07/2011 - 05/2015 with Seat-Fitted Airbags, Black Duck Seat Covers. PX2 PX3 Ford Ranger - XL- SUPER CAB COMBINED SET - Front Seats & Rear Jump Seat. XL, from 07/2011 onwards. Black Duck Seat Covers. Single Cab Driver & Passenger Bucket seats (pair) (Air Bag Certified) Mitsubishi TRITON MQ & MR form 2015 on: Black Duck Canvas & Denim Seat Covers. CLUB CAB FRONT & REAR seats Mitsubishi MQ & MR Triton - GLX from 2015 onwards : Black Duck Canvas & Denim Seat Covers. GLX, CLUB CAB - FRONT Driver & Passenger Bucket seats Mitsubishi TRITON MQ & MR - from 03/2015 on-wards: Black Duck Canvas & Denim Seat Covers. GLX, GLX+ and GLS - FRONT Driver & Passenger Bucket seats Mitsubishi Triton MQ & MR - Dual Cab from 03/2015 on-wards: Black Duck Canvas & Denim Seat Covers. EXCEED Dual Cab Complete set fronts and rear Mitsubishi Triton MQ: Black Duck Canvas & Denim Seat Covers. Thank you to Andrew and Belinda for the great service. Thanks for the unbelievably awesome service!